Now you are here, but that does not mean that you are done with your visa and other obligations. Please check everything carefully! :) There could still be a lot to cover. Full and official information available at Ministry of the interior website. Useful information in the Ministry of the interior document (PDF). Not your case? Make sure you have a short-term visa. Staying for more than one semester? Make sure you have long-term visa or a long-term residence permit granted before you arrive! If you don't have a visa granted in your passport before you arrive, there is no way you can extend or change it. To do so, you would need to travel to another country to apply at a Czech Embassy. Save trouble in advance and make sure your visa is stamped in your passport. After your arrival, make sure that you have done everything and your visa is valid. 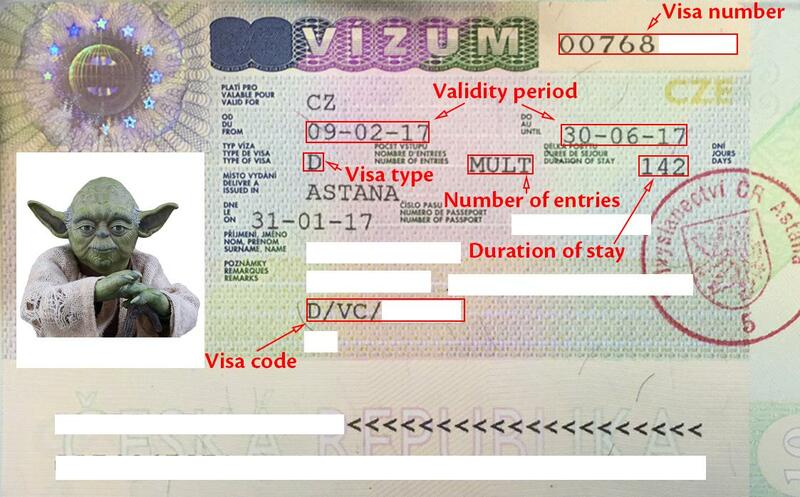 If you are in any doubt, or if anything is not clear to you, please contact our Visa Coordinator (visa@isc.cvut.cz). The important information is not only until when your visa is valid but also "duration of stay"
It may differ from your "Valid until" date, so make sure you count your days! The duration of your stay is counted from when you arrived in the Schengen area, not only in the Czech Republic! If you travel outside of the Schengen area, days from "duration of stay" are not counted during that time, but make sure the immigration officer stamps your passport with leaving and entering dates! Be careful about this – Did you travel around before getting to Prague? This is very important! Please double check that your "duration of stay" covers your whole stay in the Schengen area. Pay attention to the kind of visa you will be issued! Depending on the type and duration, some other procedures upon arrival will be necessary! There are plenty of obligations you have to fulfill. Please check this very carefully. Your dormitory does this for you. In private accommodation talk to your landlord about it. If he hasn't done it, do it yourself (within 3 working days). More information at the Ministry of Foreign Affairs website. For every visit you have to book an appointment: +420 974 820 680. Ask your Buddy to call there and make you an appointment, he will need your name, passport number and date of birth. If your Buddy is not available ask our Visa Coordinator (visa@isc.cvut.cz). If you don't have all the paperwork done on time, go to the MOI office anyway and show what you have. When you have started the application they can extend the deadline for you. More information at the Ministry of the interrior website. To report a change of address or a change of travel document, visit the Foreign Police.